AMEG WEBSITE | Interview with Michael Adamick, U Flecku’s Brewmaster. Interview with Michael Adamick, U Flecku’s Brewmaster. 10 Oct Interview with Michael Adamick, U Flecku’s Brewmaster. A few years ago, when I met to Michael in Italy, he was in the training for Brewmaster, nowadays he’s the current and younger Brewmaster of the ancient Czech Republic’s U Fleku. In recents days I was in U Fleku brewery and I though, that it could be a great idea to share Michael’s way of thinking. Please tell me a little bit about you… what is your age?, what kind of music do you like?, what is your hobby? My name is Michael Adamík and I am 26 years old. Nowadays I am working as a brewmaster in the brewery U Fleků. My favorite music band is System of a Down…and my hobby.. it is Motocross, I’m a semi professional racer and I won a lot of Races in Czech Republic. Than my hobby is of course Beer and beer tasting. So, how do you came into the beer world? I have studied in Prague for Brewmasters (SPŠPT Podskalská) and in the year 2010 I started my beer career in the brewery U Fleků and in 2015, I became a brewmaster, after 42 years long career of Ivan Chramosil in U Fleků. And I am still here. Do you remember your very first sip of beer? My first sip of beer? I really do not remember…but I think that I was born with a glass of beer in my hand. How it was your beer education? We have brewed so many types of beer at my school, and as well I brewed the beer at home…that was my preparation for the beer career. In beer terms, what inspire the most? Inspiration for the beer brewing are trends in world…but we make everything in the traditional way, with traditional ingredients, but is is good to learn new technics and try it in small batches at my brewery. What does represents to you, to be the brewmaster in U Fleku? 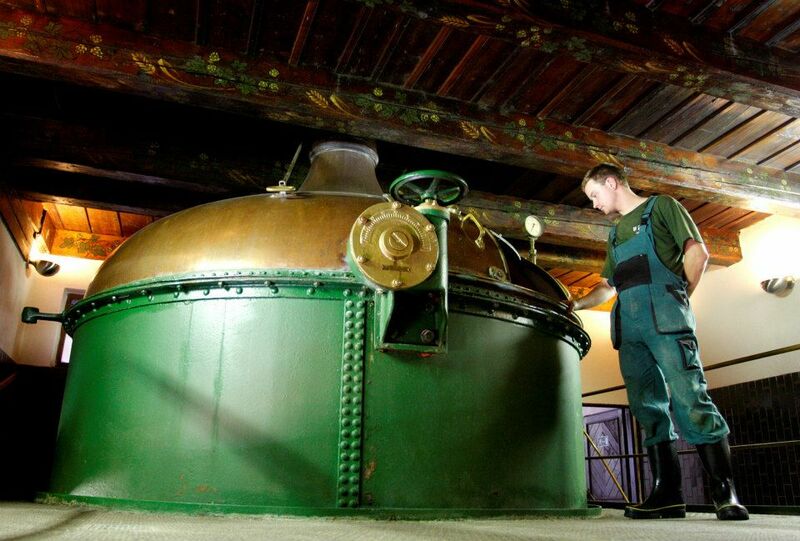 It is a honor to be the brewmaster of U Fleků, because the brewery has a very long tradition, since 1499. And because my family is the owner of the brewery, since 1921. My greatgrandfather was the first one, who became the brewmaster in U Fleků, and it is big honor be a successor of this family tradition. Please tell me a little bit about the ancient history of U Fleku. The Brewery and Restaurant U Fleků is situated in Křemencova street in the historical centre of Prague. Beer has been brewed here since 1499, U Fleků is Prague’s oldest brewery preserved to this day. The spacious premises of U Fleků offer many places of interest. Especially unique is the brewhouse, where beer is still brewed under original medieval wooden beams impregnated with ox blood. The brewery offers a tour for showing to the visitors all its equipment. You can also visit our museum in a former malthouse. The main attraction of the Brewery and Restaurant U Fleků is of course local beer. History of U Fleků special dark beer, the only kind brewed here, is over 150 years long. It is produced from traditional raw materials – water, barley malt, hops and yeast. This beer is sold exclusively at U Fleků. In the year 1898 Václav Brtník, my greatgrand father began to work in U Fleků, then in 1905 he became a brewmaster and in 1921 he bought the whole brewery and restaurant. In 1949 the brewery was nationalized by the communist government and in 1989 after the revolution in czechoslovakia the brewery and restaurant was returned to our family. What do you think about the new microbreweries there in Czech Republic? I think that is very good that the microbreweries are growing in Czech Republic. After the revolution in 1989 was just 1 microbrewery in Czech Republic and it was U Fleků, now we have more than 400 microbreweries in Czech Republic. Now people are learning about good and special beers, which are brewed by this new breweries. The beer culture is growing up in Czech. And I specially like to taste a lot of different types and styles of beer. You are the inheritor of an ancient tradition in brewing…but, you are so young, so, are you expecting just follow the same path or maybe you will do something new?? So, I have to keep the tradition, because the tradition of brewing the type of beer of U Fleků has more than 160 years, and people come here to taste this traditional beer…but once in the year, I made one brew of special Beer for Christmas, but this specialty is not sell in our restaurant, it is just for our employees. And every year I made different type of this specialty, this year will it be so special than ever. U Fleků Beer is my favorite one. So I like IPA and I like to taste them in every brewery where I am. Can you share a few advices for the young people who want to start a beer business? If you like beer, than follow your dreams, learn, drink and make the best beer that you can make, then come the success. And is better brew 2 types of beer perfectly than 10 types of bad beer, that’s my opinion. I think that’s everything that I want to say, thank you and cheers.